In a large pot add the olive oil, garlic, onion, salt and put the heat on medium. Once the onion is translucent add the crushed tomatoes. Allow this to come to a boil and then lower the heat to allow it to cook for 30 minutes on a low boil, uncovered. Stir several times. Remove from the heat, stir in the butter and let this cool. Now add the balance of the ricotta cheese, Romano cheese, shredded mozzarella cheese, and sauce in a large bowl and stir this all together. Cook your ziti halfway of the recommended time. Strain and add it to the bowl of cheese and sauce and fold it all together. Spread 1-cup of the reserved sauce in the bottom of a 9″ x 13″ baking pan. Bake in a preheated 350-degree oven for 30-45 minutes! You’ll see the sides bubbling then remove it. 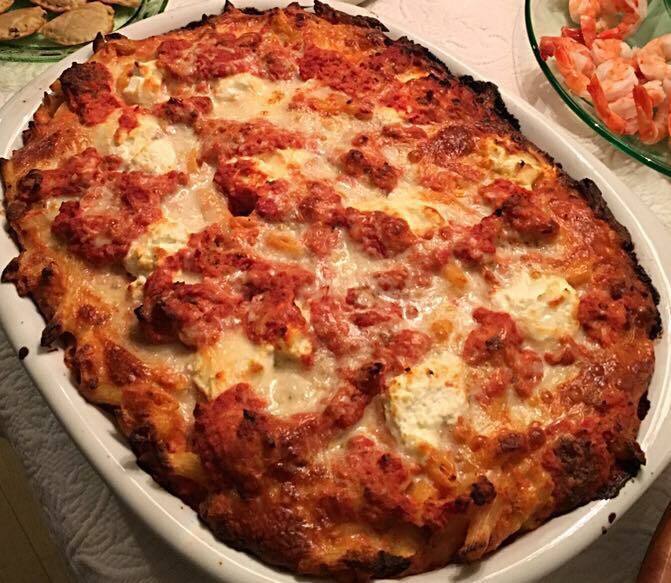 Note: Draining the Ricotta is critical in making a nonwatery ziti. Empty the ricotta into a strainer lined with cheesecloth and place the strainer over a large bowl. Cover the top with plastic wrap and allow this to drain for 24 hours in the fridge. Press any remaining liquid out of the ricotta. Food brings people together, peacefully.